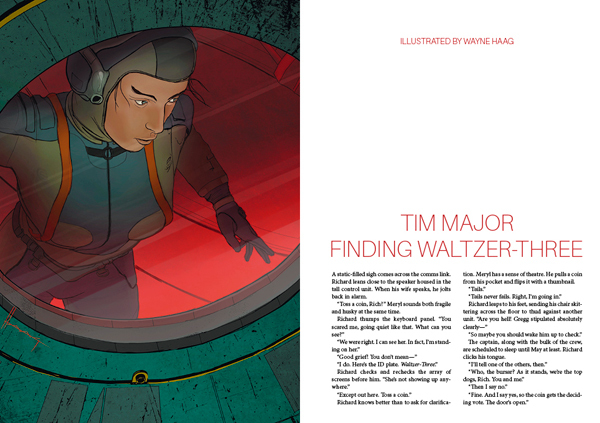 The Interzone team have revealed the illustration for my story, ‘Finding Waltzer-Three’, which appears in issue 255. It’s by Wayne Haag, the same artist who created the terrific cover. I love it. It’s the first time that any of my stories has been illustrated. I couldn’t be prouder. 17 Nov 2014 update: And Interzone #255 is available in print now! Click here and scroll all the way to the bottom. You’re very welcome Tim, glad you like it!